Finer print quality with faster production times. Our advanced 12-colour lithographic presses run 24/7, processing 12,000 double sided B1 sheets an hour. Personalised print at the speed of digital. Our flagship B2 – Indigo HP10000 and 2 SRA3 digital presses deliver premium personalised print on demand. Print you can’t miss. Our Vutek machines print directly onto most substrates up to 3.2 metres wide. Perfect for window decals, large point-of-sale and exhibition work. Attention-grabbing signs, designed, produced and fitted. With 5 printers, a state-of-the-art Zund cutter and bags of creative solutions, we’ll help you get the best from your spend. Powerful tools at your fingertips. 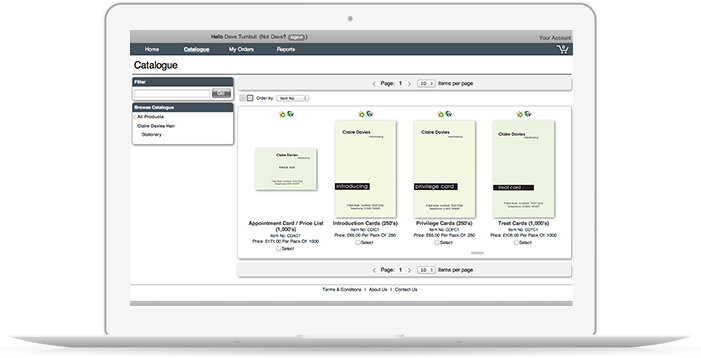 Plug in and enjoy round-the-clock control of your print volumes and spend – and order bespoke printed products in just a few clicks. Logistics headaches solved. Our fulfilment team handles the finishing touches – and gets your print where it needs to be. From fine art books, catalogues and brochures, right through to posters and gift stationery, lithographic printing from L&S means flawless printed results. Litho is the best printing process to deliver the most accurate results at high volumes, so we’ve invested in multiple state-of-the-art lithographic printing machines that are now the powerhouse of our site. Each machine runs 24/7, and together they’re capable of processing up to 12,000 double sided B1 sheets an hour. Printing round the clock means we can meet your deadlines, however tight they are. But that doesn’t mean you have to sacrifice quality. Our experts oversee the whole process from start to finish – calibrating and constantly checking everything down to the fine details as your work comes off the press. We’re with you every step. As well as printers, our clients tend to see us as partners – not least because we work closely with you from that first phone call to final delivery. Plus, we’re always here to give you advice, keep you updated and answer any burning questions. We know print-speak can sometimes sound like an alien language, so we promise to make everything simple and easy. Getting your colours right isn’t just important – it’s essential. Lithography is how we achieve meticulous colour matching, and even allows you to work with a range of special and unusual inks, including fluorescents and metallics. We really hate saying no. So if you have an unusual brief, tell us about it. We love matching your design ideas with our printers’ skills, and have a myriad of paper and board stocks available – not to mention textured and coloured papers – that can really enhance an image and add another dimension to your finished product. Digital printing has fast become one of the most versatile ways to deliver highly personalised, on demand print. L&S is right at the cutting edge of the digital print market, giving you options ranging from personalised, data-merged documents that speak directly to your audience, through to bespoke gift-stationery and unforgettable art booklets and posters. As digital print doesn’t involve the set-up costs of lithographic printing, it’s also a great option for short runs where timing is critical. In other words, it’s not just cost effective, but can save you time too. At L&S we make a point of using HP Indigo’s Pantone®-licensed ElectroInks. For us, these inks deliver the offset quality our discerning clients expect, complete with accurate spot colours and white. And because HP ElectroInks have a very small print particle size – down to as small as 1 or 2 microns – you’ll get premium prints with a wide and accurate colour gamut, sharply detailed image reproduction with uniform consistency, and very thin image layers. In fact, you might never know it was printed digitally. We’re able to merge your data and artwork to deliver personalised literature and even more effective marketing campaigns. However complex the project, a great deal of care goes into this process – which is why your items are always personally picked, packed and double-checked. We make it our business to make sure every person gets the right piece of mail, delivered to their address, whether that’s nationally or globally. When it comes to personalised financial mail, or individual marketing, our consideration for security is right up there with our commitment to quality. We lock down our site for extra security whenever it’s necessary, and nothing leaves the site without being double-checked. For extra peace of mind, we also operate to strict FSA data protection guidelines and ISO 27001. Want to supersize that? L&S has invested in all the equipment necessary to print in large formats up to a whopping 3.2 metres in width and 50mm in thickness. Large format is the perfect medium to make a big splash, and we can help with graphic displays at the point of sale, on signs, or at exhibitions. Our service is also ideal if you’re looking for large-format fine art prints and posters. Depending on your requirements, we can print directly onto canvas, backlit film, wood, metal, glass, plastic and ceramics using our cutting-edge UV presses. And with our new dye-sublimation print technology, we can now print on a vast range of fabrics, so the possibilities are almost limitless. Then there’s our sophisticated cutting technology, which allows us to create eye-catching shapes in any form you like, from snowflakes to cut lettering. A huge percentage of our clients return to us again and again, confident in our ability to process their work and deliver it. And because we take care of things from end to end, you’ll know every detail is looked after in house – from planning, printing and cutting, to picking, packing and distributing your finished print. We print in full colour as well as in a white ink to create different effects with opacity. And if your artwork is for a window display, we can always reverse the image for mounting on the inside of the glass. We distribute print to stores throughout the world on a daily basis, which means we have a unique understanding of the retail environment. In turn, you can be sure our team will carefully pick and pack all your items and deliver everything to your door or shop floor, for exactly when you need it – even if that means next day delivery. Don’t need it straightaway? We make life easier by holding on to your stock in our warehouse until it’s ready to be delivered. And don’t forget: the way we pack your POS can be completely customised so it’s unpacked in the same order as it needs to be put on the shelves. With a lot of planning and an indepth assessment of your needs, our professional fitting team will deliver the results you need. We make a point of not getting in the way, and because we know the importance of deadlines, we’ll meet yours without fail. This means if you’re open at 9am, we’ll work through the night to get everything ready for the big reveal. We stick to all relevant health and safety requirements on and off site, and give you peace of mind that we’re always looking out for your staff and customers’ wellbeing. All our fitters are fully licensed to carry out all aspects of installation, and our ethos of rigorous quality control means we’ll check, double-check and triple-check that everything’s as it should be. Finishing a print job properly isn’t just about boxing everything up and loading the van. It’s about putting the cherry on top. With everything under one roof, we have a full suite of state-of-the-art finishing equipment, as well as a team of skilled finishers, to make sure your prints are cut, folded, bound, collated, laminated and more, exactly as you’ve specified. It makes us a true end-to-end print provider, and means we can look after quality right from the off. Fulfilment represents the final part of the production jigsaw. When every item has been counted, picked, packed and double-checked, your items are boxed, numbered and allocated, ready for delivery. We also make it easy to track your order on its way to its final destination. We carry out all relevant health and safety checks – including risk assessments and method statements – as standard. Then there’s our comprehensive range of installation and fitting services, with a highly experienced and qualified team on hand to follow your brief to a tee. Don’t want us to deliver the next day? That’s absolutely fine. We’ll keep hold of your stock until you’re ready to receive it. Plus, you get to use our online stock management service for efficient ordering. We understand that not every business has a warehouse handy to store printed stock, so we’ll look after it until you need it and deliver only when it’s ready to be used. This service complements our Web2Print service, which lets you order exactly what you want, when you want it. We’re comfortable putting together large mail-outs to individuals, even when each piece of mail needs to be personalised. Many of our major financial clients already use our high volume solutions, we apply just as much care and thought to lower volume runs for direct marketing campaigns to individuals or private addresses. At all times we pay strict attention to security and can lock down the site if you need us to. L&S’ online print buying services are available 24/7, which means no waiting for prices or proofs. Our simple to use system gives management control over who can see and buy items, and lets you set spending limits on price or quantities. It’s also the perfect solution to control branding and quality. We’ll happily provide online templates for your staff to use and create bespoke printed products, complete with varying levels of authorisation before printing if necessary. Many of our clients benefit from being able to upload their artwork and submit jobs as soon as they’re ready to go. 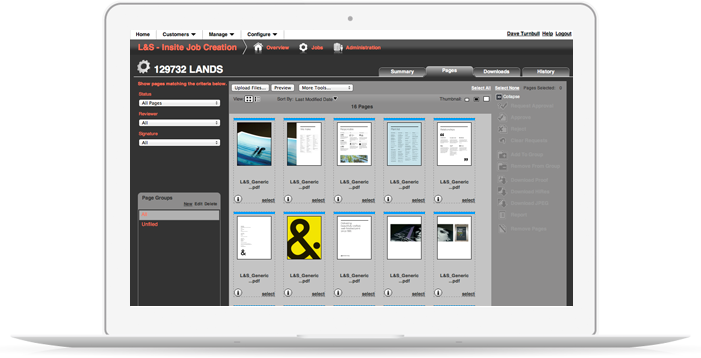 Collaborative proof approval, the recording of annotations and comments, colour separations and a complete page by page history is archived with your original files and your approved, print ready PDFs. Artwork can be instantly proofed and approved online at any time of the day or night. Whatever your needs, we’ll build our online print management service around you, and make it accessible wherever and wherever you or your staff are. L&S employs a six-strong team whose time is dedicated to preparing prices and getting an estimate over to you quickly. But they aren’t just number-crunchers: they’re here to make recommendations on our wide variety of paper, board and other materials available. They’re also well qualified to advise on all areas of production, up to and including our many finishing options.